Now that fall is in the air, it is Pumpkin Spice season! I am a true fan of all things with cinnamon, so I am a die hard Pumpkin Spice fan! It is getting down into the 40’s here at night and we had to pull out the down comforter last night as I just couldn’t get warm! So it’s time to start those chilly mornings off right with a nice hearty warm breakfast. 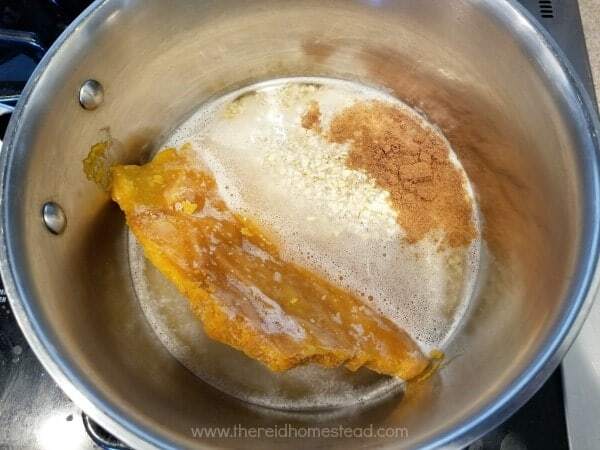 Last week I shared with you how to Preserve your Pumpkin and Winter Squash by Roasting and Freezing. This week, I wanted to share with you one of my favorite ways to use up some of that frozen pumpkin. When the mornings are chilly, there is nothing like a warm bowl of hearty steel cut oats to warm your soul. Add in a little maple syrup, pumpkin spice and some pecans or walnuts, and life is good. This is a whole foods vegetarian recipe that can easily be made vegan/plant based. 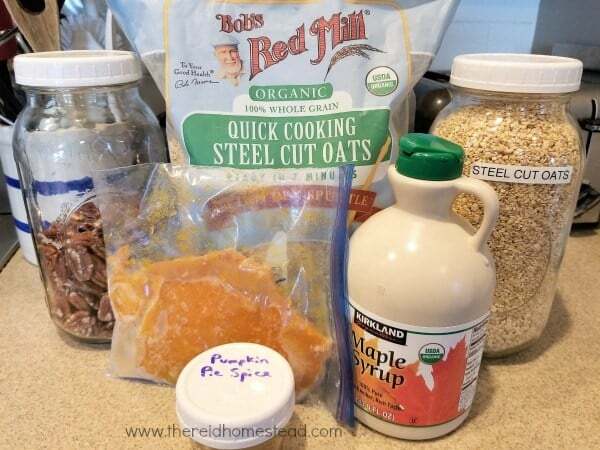 I hope you enjoy this recipe for Hearty Pumpkin Spice Steel Cut Oats as much as I do! 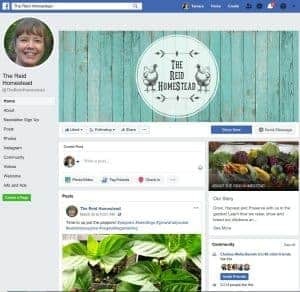 Please pop over to our Amazon Shop to see all of our favorite Homesteading, Gardening and Kitchen tools! You might also be interested in our article 7 Reasons Why You Should Grow Blue Jarrahdale Pumpkins. I like Bob’s Red Mill Quick Cooking Steel Cut Oats, as they cook in 7 minutes instead of 20. 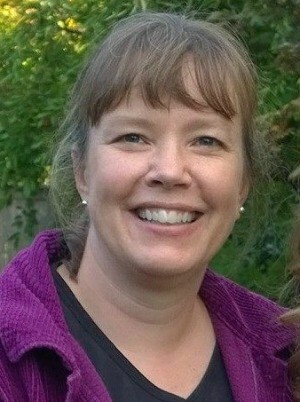 I am not a morning person to begin with, so anything that makes my morning quick and easy is a good thing! You will also need Pumpkin Puree (to make your own for the freezer, see my post from last week here) and Pumpkin Pie Spice. You can make your own Pumpkin Pie Spice by mixing together 4 spices. Mix 1 tspn of ground cinnamon, 1/4 tspn of ground nutmeg, 1/4 tspn ground ginger and 1/8 tspn of ground cloves. Optional ingredients are maple syrup (or honey), pecans or walnuts, and a little milk (not shown). Plant based milk is fine too, almond milk is my favorite. 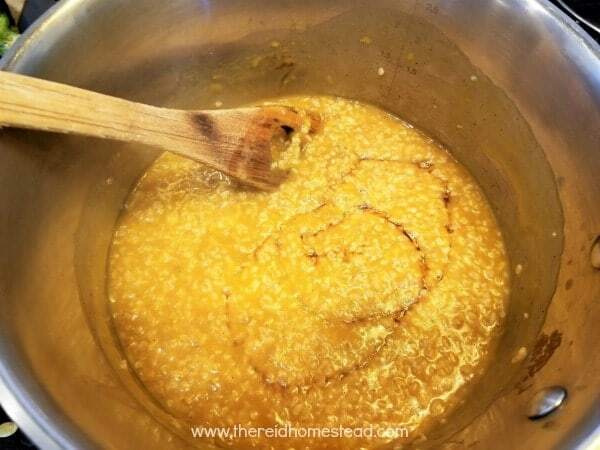 Add the 2 cups water, 1 cup quick cook steel cut oats, 1/2 cup pumpkin puree and your pumpkin pie spice to a medium size pot that has a lid. Bring to a boil. Stir. Put lid on pot and turn down to a simmer for 7 minutes, stirring occasionally. When the 7 minutes are up, you may add a couple swirls of maple syrup to sweeten, approximately 1-2 TBSN’s should do it. This is optional though, so if you are cutting out sugar, you can skip this step. After stirring in the maple syrup, you are all ready to dish it up. According to the directions on the steel cut oats, this makes 4 servings. But they are kind of small servings. For adults, 3 servings is probably more realistic. 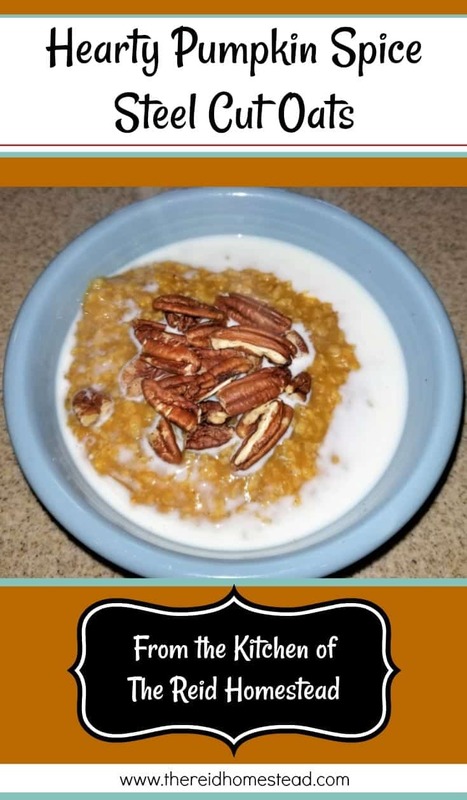 Optional ingredients are topping the steel cut oats with some chopped pecans or walnuts, and adding a splash of regular milk or plant based milk. 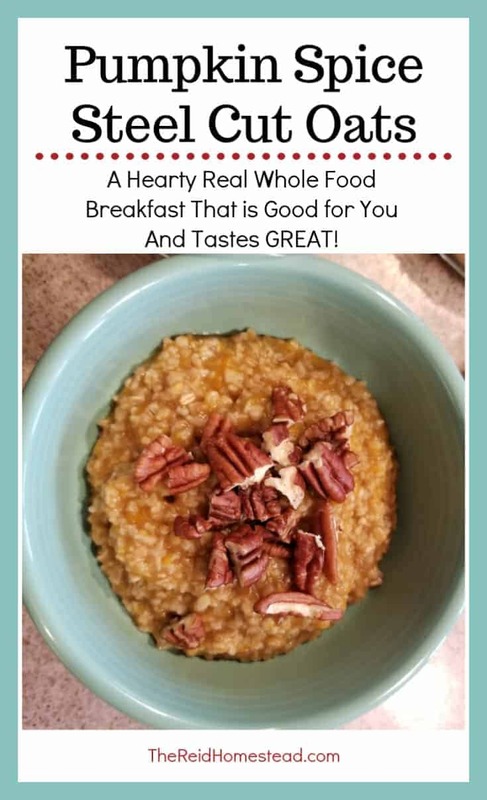 I really hope you enjoy this Hearty Pumpkin Spice Steel Cut Oats recipe! An easy hearty breakfast that will warm your soul. Add water, quick cook steel cut oats, pumpkin puree, and pumpkin spice to a medium size saucepan with a lid. Bring to a boil and then stir. Immediately turn down to simmer and put a lid on the saucepan and stir occasionally and let simmer 7 minutes. Take off of heat. Stir in maple syrup to taste (if using). 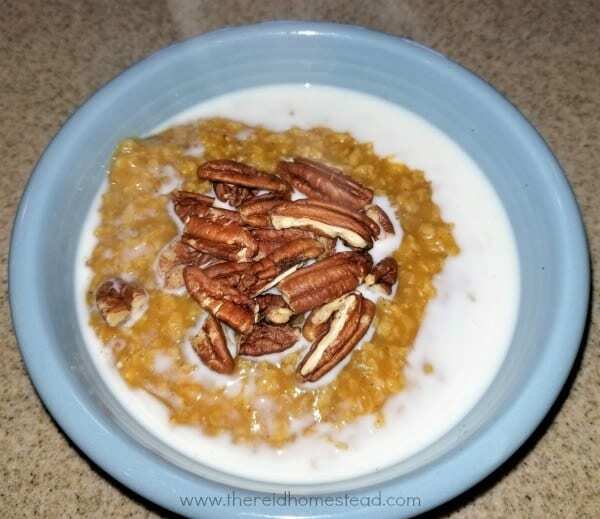 Serve the pumpkin steel cut oats in a bowl. 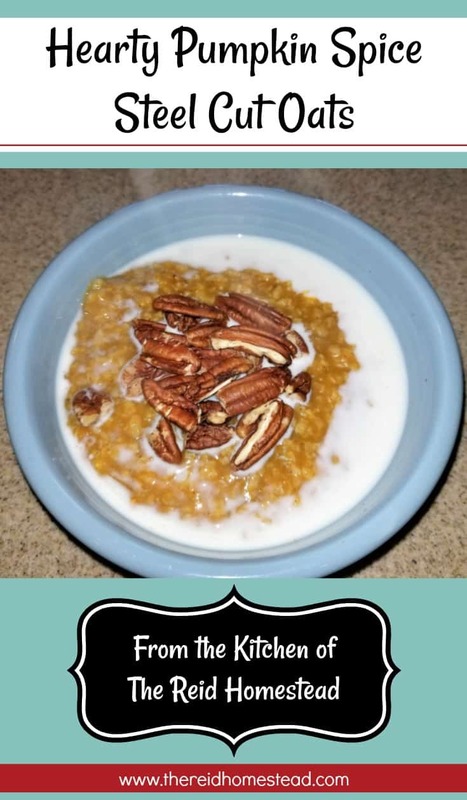 Top with pecans or walnuts and a splash of milk and enjoy! If you enjoyed this recipe, or want to make it in the future, please share it on Pinterest or Facebook so that you can find it easily later! Thank you so much!